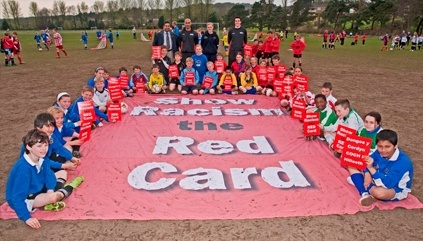 Show Racism the Red Card Wales gives thanks to everyone who voted for us and promoting our participation in the 2012 National Lottery Awards! "Just voted, not because people told me to, but voted because I wanted to. Wanted to support an organisation that is working hard to eradicate harassment and hate from our schools, parks, stadiums, work, homes and our society." Despite not making it through to the final round, we did gain a huge number of votes - which SRTRC Wales are absolutely thrilled with. We are extremely grateful for all those who urged others to vote for us on their Twitter and Facebook feeds, as well as other social media sites. We would also like to take this opportunity to thank anyone who publicised our nomination for the awards. The publicity we received from being nominated has helped our campaign grow in stature and has made a wide variety of people far more aware of the effects of racism in sport and society.